This book provides an invaluable, comprehensive and practical introduction to conservation issues associated with current farming practice. Representing both industry and conservation as an integrated and holistic system, it explores conservation issues within every farming discipline; from arable and horticulture to grasslands, woodlands, aquatic and coastal farming and will include an assessment of the impact of global warming. The book includes relevant case studies and international, real-world examples, focusing on applied management and not just ecological facts, theories and principles. The carefully structured book begins by introducing the overall subject including some statistics on current farming activities, giving a brief outlook for the future of farming systems in relation to conservation. Each subsequent chapter will have its own introduction setting the commercial context and conservation value of an example farm, and will progress with a series of case studies that will include the following elements: site assessment; species list; soils management options; and a habitat management plan. A summary section will draw together the common themes of the chapter and develop a lead-in to subsequent chapters. It will provide students with an informed appreciation of current practice whilst raising questions about the development of conservation in farming in the future. 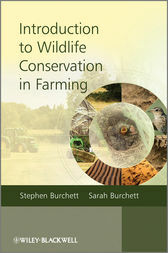 Stephen Burchett and Sarah Burchett are the authors of Introduction to Wildlife Conservation in Farming, published by Wiley.